In digital marketing, it pays to create an engaged audience who regularly tunes in to your content. Although engagement isn’t necessarily the end goal, it’s hard to deny the power of content that pulls a reader in. Here are the final six blog post ideas that help to create a captivated audience. Similarly to the FAQ post, the question post answers questions that your audience asks in social media, on forums, or in the comments section of your blog. In contrast to the FAQ post, though, the question post may be about something that isn’t commonly asked yet is an engaging question to build an article around. The answer post is the sister of the question post. In this post type, you simply ask a question and allow your audience to answer it in your comments section. This type of post is generally very short, allowing your audience to create the bulk of the content through a discussion in the comments. This type of article works well if you have a blog with an engaged readership that comments often. Use a blog post to pose a challenge to your audience. 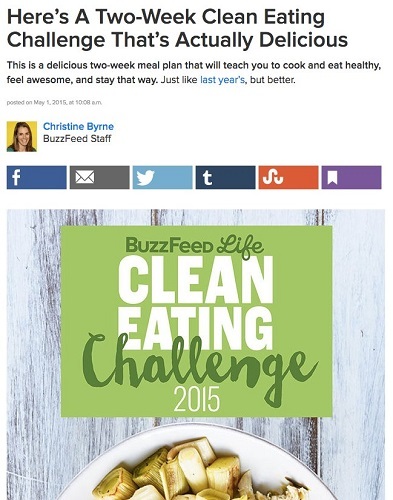 Below, BuzzFeed challenges its readers to eat cleanly for two weeks and posts the steps and recipes to follow to reach that goal. This post can work well as a series, with periodic updates that feature participating audience members. BuzzFeed creates a challenge post to engage its audience. Use your blog to feature a customer or project that you and a customer have worked on. Although this type of blog post type is partly promotional, it also builds engagement. Use a blog post to allow your audience to access a relevant giveaway. The giveaway can include a free download, case study, or one of your products or services, for example. Center your blog post around this promotion.